Francis Scott Key Fitzgerald was an Irish American Jazz Age novelist and short story writer. He is regarded as one of the greatest American writers of the twentieth century. Fitzgerald was the self-styled spokesman of the “Lost Generation”, Americans born in the 1890s who came of age during World War I. He finished four novels, left a fifth unfinished, and wrote dozens of short stories that treat themes of youth, despair, and age. Flappers and Philosophers was the first collection of short stories written by F. Scott Fitzgerald. This book contains selections from the F. Scott Fitzgerald collection Tales of the Jazz Age. The short stories collected here include the novelette May Day and the novella The Diamond as Big as the Ritz. The book is divided into three parts: My Last Flappers (The Jelly-Bean, The Camel's Back, May Day, and Porcelain and Pink), Fantasies (The Diamond as Big as the Ritz and The Curious Case of Benjamin Button), and Unclassified Masterpieces (The Lees of Happiness, Mr. Icky, and Jemina the Mountain Girl). FCIT. "F. Scott Fitzgerald author page." Lit2Go ETC. Web. 20 April 2019. <https://etc.usf.edu/lit2go/authors/176/f-scott-fitzgerald/>. 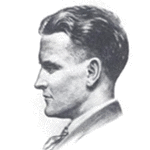 FCIT, "F. Scott Fitzgerald author page." Accessed April 20, 2019. https://etc.usf.edu/lit2go/authors/176/f-scott-fitzgerald/.